Last night was a late one. A really late one. You can’t remember the last time you stayed out so long after midnight. But the al fresco dinner didn’t start until after 9 pm. Your three-course meal featured garlicy grilled langoustines with a refreshing mango and papaya salad, a thick beef fillet with charred asparagus and decadent truffles, and orange panna cotta with fresh mint. Wine, in varietals of which you had never heard, was flowing freely. Conversations between the red chairs did, too. While flickering candlelight, the starry sky, and an extra glass of sherry made you linger in the courtyard long after the plates were cleared. So this morning, you did something else that you usually don’t do. You slept in. When the alarm starting ringing, you didn’t hit snooze. Despite sunlight pouring through your room’s sheer curtains, you turned the damn thing off completely. A swim, an excursion, and even coffee could wait. You needed a few more hours before you were willing to face the day. You feel wonderful now that you’ve had the extra time, though. You wake up with a sense of rejuvenation. You lie in bed for a few extra minutes to look around your adorable room. It has thick walls and a high ceiling, original wooden beams and polished terra-cotta tiles. The eclectic decor proves that the owner is a traveler. The wooden headboard on the king bed looks like it’s from Africa (Zimbabwe, you later learn). The textiles are clearly Indian. Plus the artwork is part of a larger, private collection. It’s the noise outside that eventually makes you get out of bed. 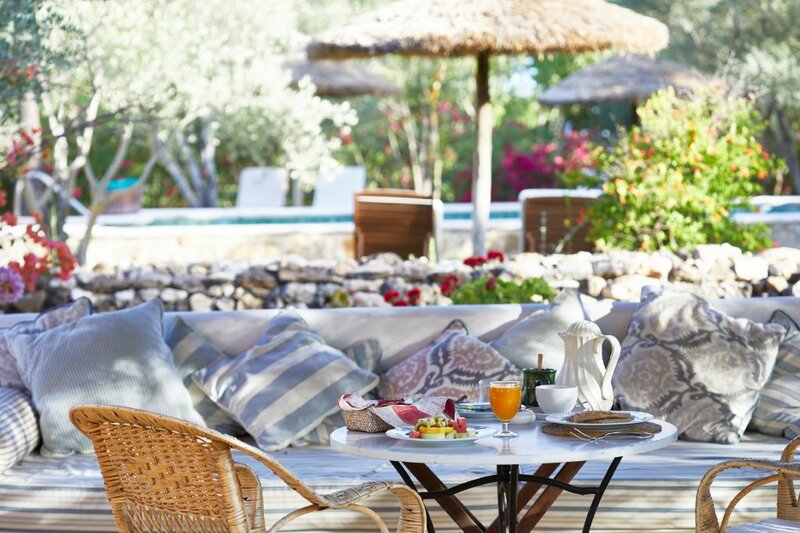 Breakfast is served on your private veranda each morning. The staff seems to have a sixth sense for when to bring it, though perhaps they were determined to finally get you out of bed today. Warm sunshine greets you when you finally open the door. Croissants and homemade jam, yogurt and muesli are spread out on the little table. There’s freshly squeezed orange juice and a pot of hot coffee, as well. Heartier dishes, like eggs and Iberian ham, are available, too. But this simple spread is all you really need. By the time you finish, you’ll decide whether to drive into the city, out to the mountains, or down to the coast for the day. This relaxing retreat is Hacienda de San Rafael. The hotel was a grand olive estate in the 18th century. It was passed down and neglected between the three generations that followed. The current owner inherited the property nearly 30 years ago. She spent years meticulously restoring the buildings and the gardens. Antique furniture, traditional farm equipment, and fresh flowers surround the fireplace in the lounge. Heavy wooden doors lead to the dining room. It’s only used when the weather turns ugly. Most nights, dinner is served in the bougainvillea-filled courtyard. Three pools, a huge garden, and the suites are beyond that. Plus fields of sunflowers and olive trees surround the hacienda. So where is this dreamy escape? Hacienda de San Rafael sits halfway between Seville and Jerez de la Frontera in southern Spain. Seville is famous for its historic architecture and tapas bars. Jerez is known for its sherry bodegas and dancing horses. The white villages in the Sierra de Cádiz mountains are instantly recognizable. While the beaches seem endless along the Costa de la Luz. 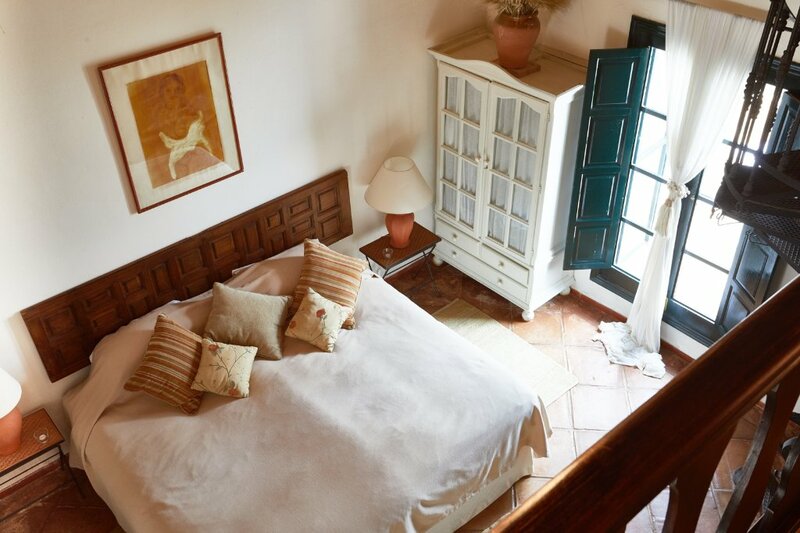 This makes the hacienda the perfect home base to explore the autonomous region of Andalusia. You just need to tear yourself away from this heavenly hideaway to actually start exploring it.